There are various studies on the influence of chitosan on mycorrhiza. Generally positive effects on the growth of mycorrhizal fungi and roots of the associated plants could be observed, followed by better plant development and harvest. The enzymes (chitinase and chitasanase) produced by plants to resist infections are specifically effective against the cell walls of phytopathogenic fungi but are inoperative against the cell walls of mycorrhiza. No harmful increase, for mycorrhiza, in chitinases and chitosanases production by soil inhabiting bacteria after treatment with chitosan was observed. The increased lignification of plant cell walls after treatment with chitosan is also not a problem for mycorrhiza fungi of arbuscular or ectotrophic because both engage the roots of plants near the root cap where the rhizodermis is still intact and forms root hairs. At this part of the root the exodermis is yet not lignified so the mycorrhiza can engage their linkage with the plants root cortex unobstructed. This is not altered due to treatment with ChiProPlant. Two german patents, one for a chitosan-based plant strengtheners and one for a fertilizer, state positive effects of chitosan on both mycorrhiza and plants – definitely no obstruction could be observed rather an encouragement also of mycorrhizal growth. "Chitosan [...] stimulates the plant's natural defence system, leading to genetic, physiological and biochemical reactions." "Interesting is the balancing effect of chitosan on beneficial organisms such, as mycorrhizae which are not affected, but encouraged." Chitosan is enzymatically degraded and changes the living conditions in a disadvantaging way for soil-borne phytopathogenic organisms. Under these conditions the beneficial microorganism, such as mycorrhiza, can easily prosper. A scientific paper from the Botanic Institute at the University of Basel in Switzerland states that mycorrhizal fungi are not attacked by the chitinases or chitosanases produced by the plant to defend itself against phytopathogenic organisms. The UFT (Zentrum für Umweltforschung und Umwelttechnologie) made a study on ChiProPlant and its effects on the growth of mycorrhiza. This study was carried out at the University of Bremen by Prof. Dr. W. Heyser and Dr. In-Ock Koh. Results show that the growth of mycorrhiza is in no way negatively influenced by the application of ChiProPlant. In fact the opposite is observable. On the pictures below you can see in vitro pine seedlings that where treated with ChiProPlant 30 days before the pictures were taken. The seedlings show a vast increase in root growth and mycorrhizal development. The structure and function of chtinases and chitosanases are complex and with a great variety amongst the different enzymes produced by different organisms. The enzymes must be specified in order to break down mycorrhizal cell wall chitin and chitosan. A study with arbuscular mycorrhized potato plants shows that chitosan (in this study called NOCC) is effective against late blight (Phytophthora infestans) without attacking the mycorrhiza. Chitosan was compared to a conventional fungizide. The yield for chitosan treated plants was increased and the disease development was delayed. 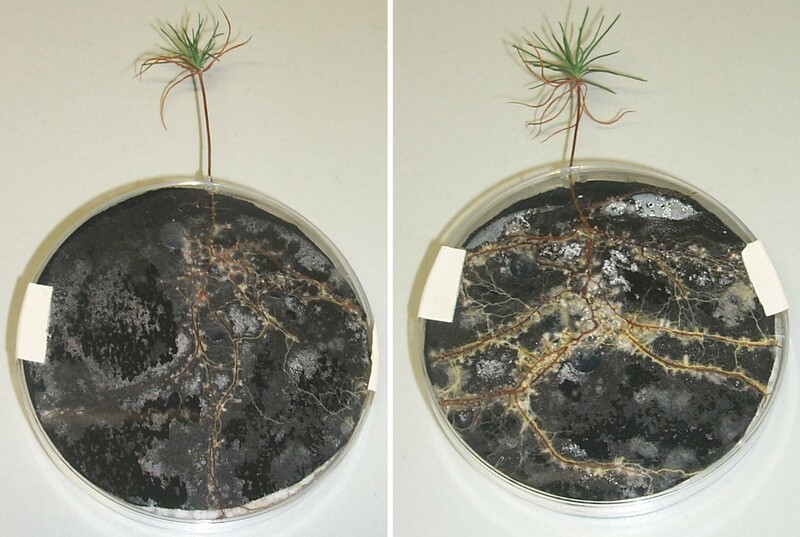 In vitro pine seedlings with mycorrhiza. Left: untreated control Right: treated with ChitoPlant.